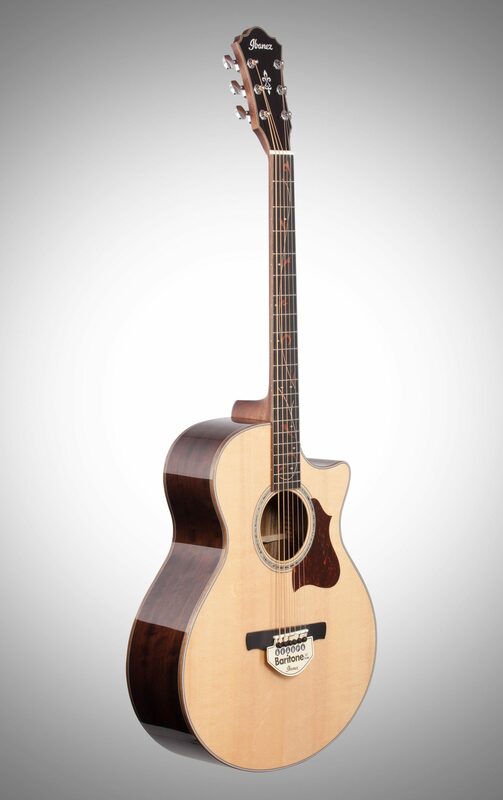 The Ibanez AE255BT Acoustic-Electric Guitar features a baritone scale which provides a deep low tone and a long sustain. 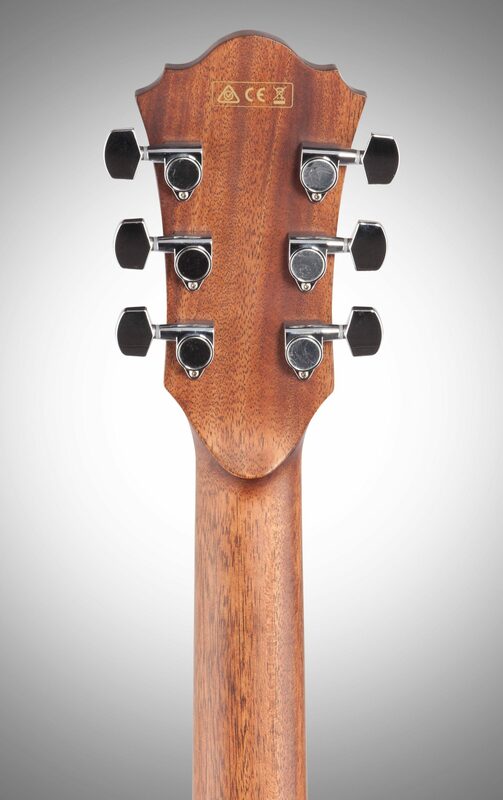 The combination of Sitka Spruce and Ovangkol generates a dynamic frequency range from deep lows to sparkling highs. It enhances the versatility of AE to match any playing styles, from aggressive strumming to fingerpicking. The slim comfort neck grip shape (in satin finish) also allows for the maximum amount playability across various types of playing styles. 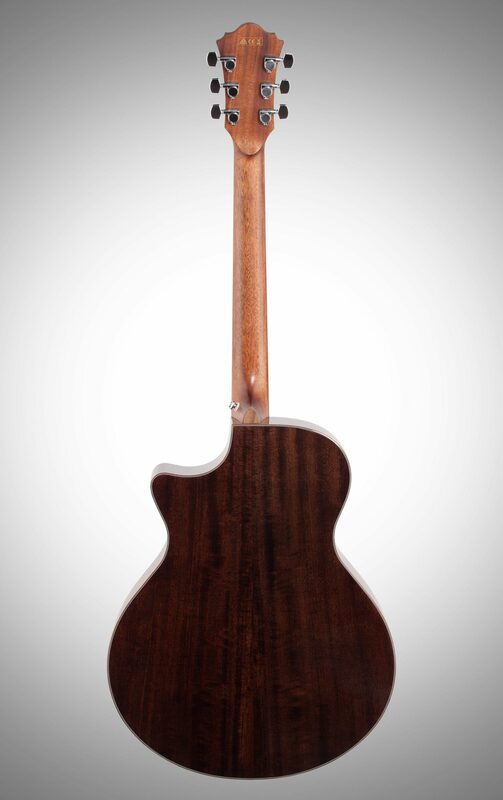 The fretboard inlay has a delicate but dynamic design, and the wooden inlays give a sophisticated feel to the guitar. The compact, on-board active preamp simply features a mute switch to eliminate unexpected parameter changes during performances. This helps reduce the guitar’s size and weight, minimize body contact, and maximize the acoustic tone. The newly designed under-the-saddle pickup equalizes the volume of each string and delivers a well-balanced signal. The natural acoustic tone from this active circuit is remarkably stable and resists noise. It will support performances on stage, from solos to ensembles. Overall: I was after a baritone acoustic guitar that I could strum and play like a standard acoustic, and allow me to sing in lower keys while playing songs with my normal chord patterns/progressions.I demo'd this Ibanez AE255BT against the better-known and highly-regarded Alvarez ABT60, which is the only other baritone I could find with a similar list-price and spec.I spent an hour A/B'ing the two guitars, and they were surprisingly very different beasts. The Alvarez is much louder (presumably due to its jumbo body) compared to the Ibanez, which has a grand auditorium style body. The Alvarez also had more sustain, a scooped frequency range (pronounced bass and treble) and powerful (almost unwieldy) overtones. The Ibanez had a far more controlled tone, with strong fundamentals and a pronounced mid-range. 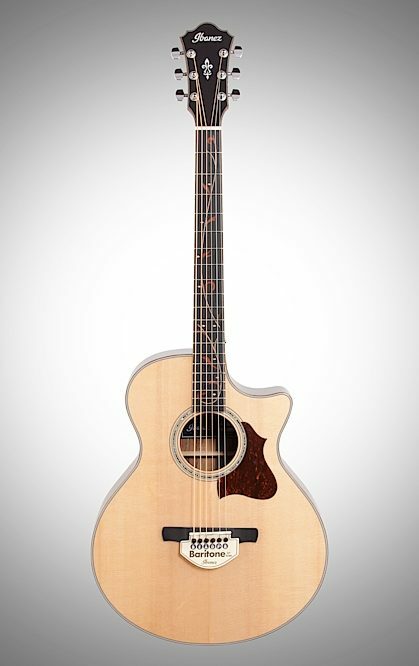 For a normally-pitched acoustic, I'd usually prefer the tonal qualities of the Alvarez, but - for a baritone - I felt it sounded a mess when strumming open chords. The Ibanez, however, retains clarity in the lower registers and can be played open, just like a standard acoustic. The fundamental tone is more suitable for this type of guitar.I found the intonation of the Ibanez to be better than that of the Alvarez. The Ibanez stays perfectly in-tune up and down the whole fretboard, whereas the Alvarez struggles to keep intonation up the frets. This is a real testament to the build quality of the Ibanez. The Ibanez is also more comfortable to hold and play, with its slimmer body shape and slimmer neck. For fingerstyle, both guitars sounded great. 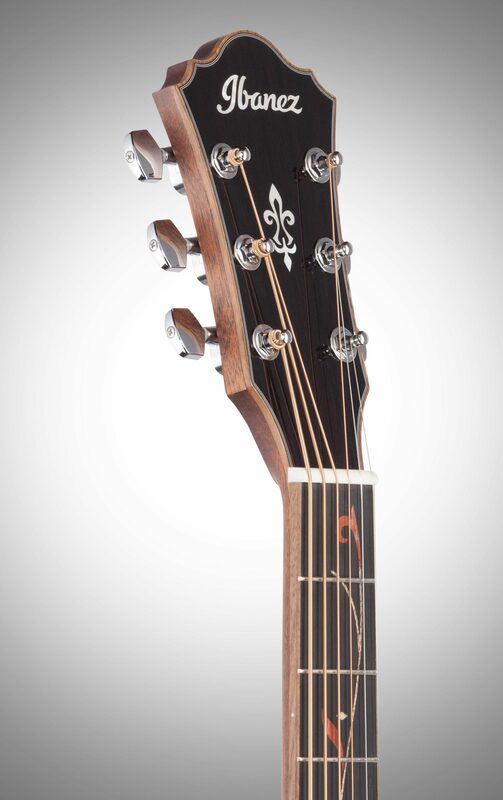 The Alvarez has a zingy tone, and you can really hear the metallic sound of the strings. 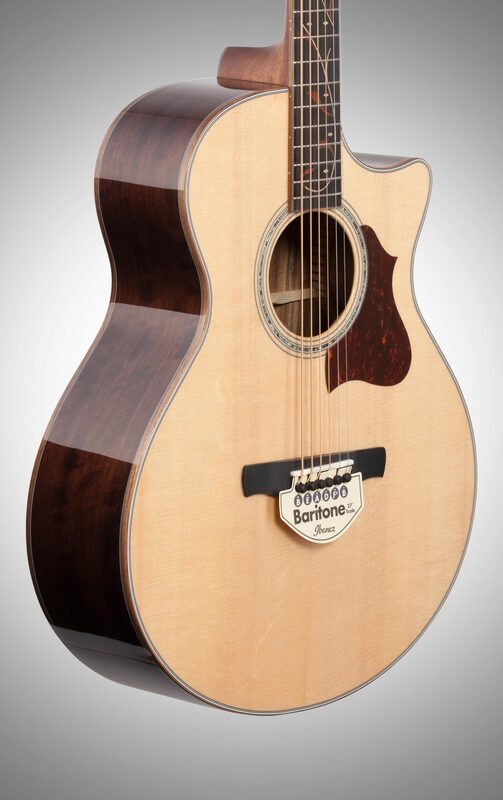 The Ibanez, although quieter, has a beautiful deep tone; the low B-string sounds similar to a bass guitar, and the overall tone is very piano-like.Overall, I felt the Ibanez was the superior baritone acoustic guitar - and I chose this over the Alvarez. 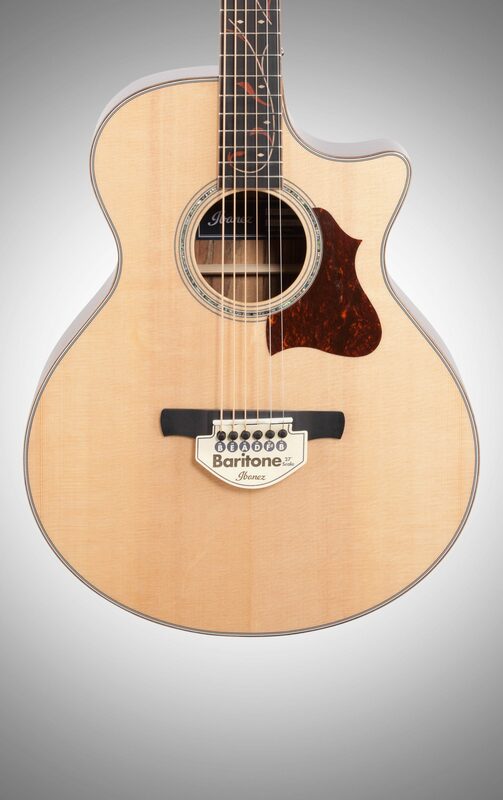 The Ibanez AE255BT is a very attractive instrument. The quality of the woods is great (solid Sitka spruce top and beautiful layered ovangkol back/sides - which looks very similar to Indian Rosewood). 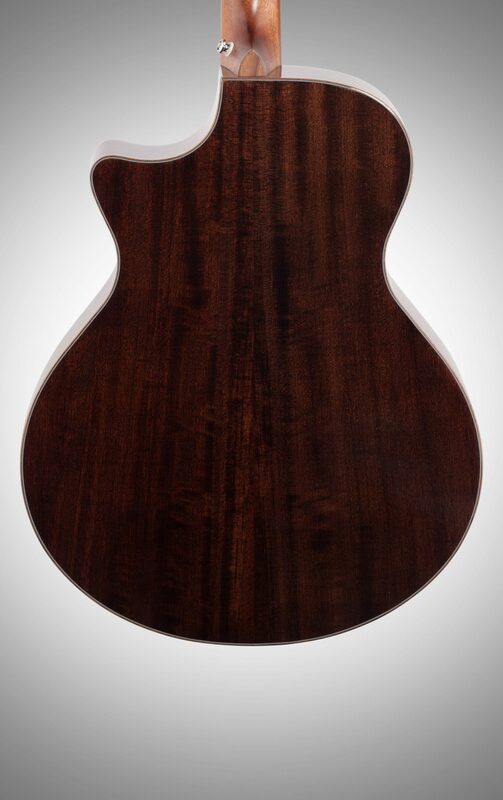 Appointments, such as the wood binding and vine fretboard inlay, surpass the expectations implied by the list price. Overall the fit and finish is impeccable; easily on par with acoustics far above its price-point.If you're looking for a baritone that plays and feels just like a standard acoustic guitar, I highly recommend the Ibanez AE255BT. It has a low, controlled and rich tone, great playability and offers exceptional value. "Barry White as a steel stringed guitar..."
Overall: Don't buy one 'blemished'. I did, and was tempted to keep it despite a slight fret buzz on the 1st string - 12th fret.B to B tuning means you need to put a capo at the 5th free to have it sound like traditional (E - E) tuning. Play the chords you normally do, but listen to them growl.I have had multiple Tacoma Thunderhawks, and this compress very well.The standard case wasn't very impressive to me, but then Tacoma cases were very good and may have spoiled me.Grab a mono dreadnought case is my recommendation.